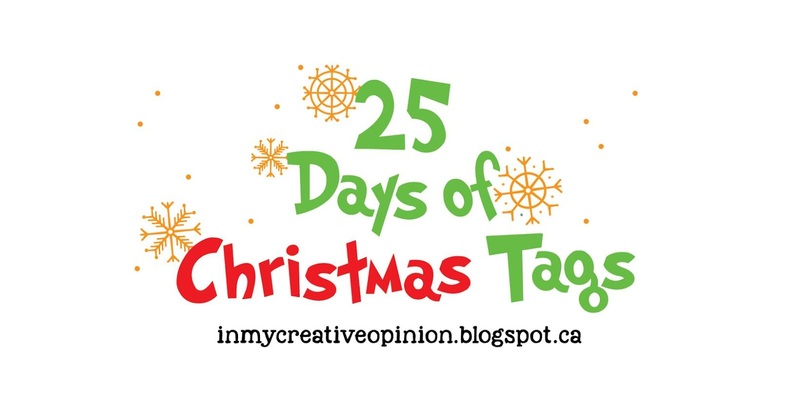 Welcome to Day 8 of The 25 Tags of Christmas Tags 2018. If you are just arriving for the first time, all the details and the linkup can be found HERE. 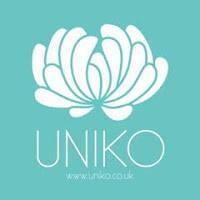 Our sponsor for Day 8 is Uniko. 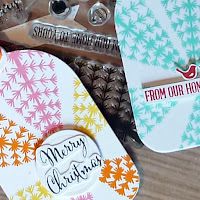 I fell in love with this modern, graphic looking Christmas tree in a stamp set called Rustic Christmas. 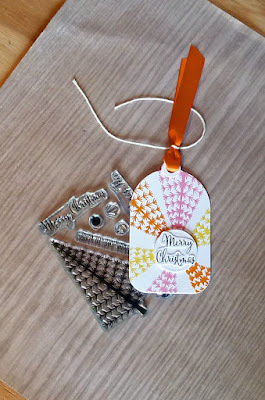 First, I used that Christmas tree in a very traditional way, to make a wine bottle tag. I masked off the right side of the wine bottle tag and sponged the left side with a few different shades of green Distress Ink. Then, I stamped the Christmas Tree over the sponged area, careful to make sure that some of the tree ran off of both sides of the green. I stamped the sentiment in red ink on a scrap, and used foam tape to pop it up. I also had fun using that Christmas tree as more of an abstract graphic element and just stamped a few patterns. 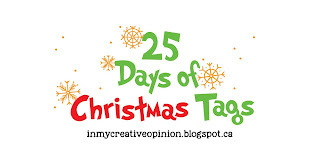 This is still a Christmas tag, but I think that if you didn't know it was a tree stamped in multiple colors, you couldn't guess it from this tag. One more just for fun, featuring those tiny birds in red. Such clever ways to use the tree image, Joyce! Love these! 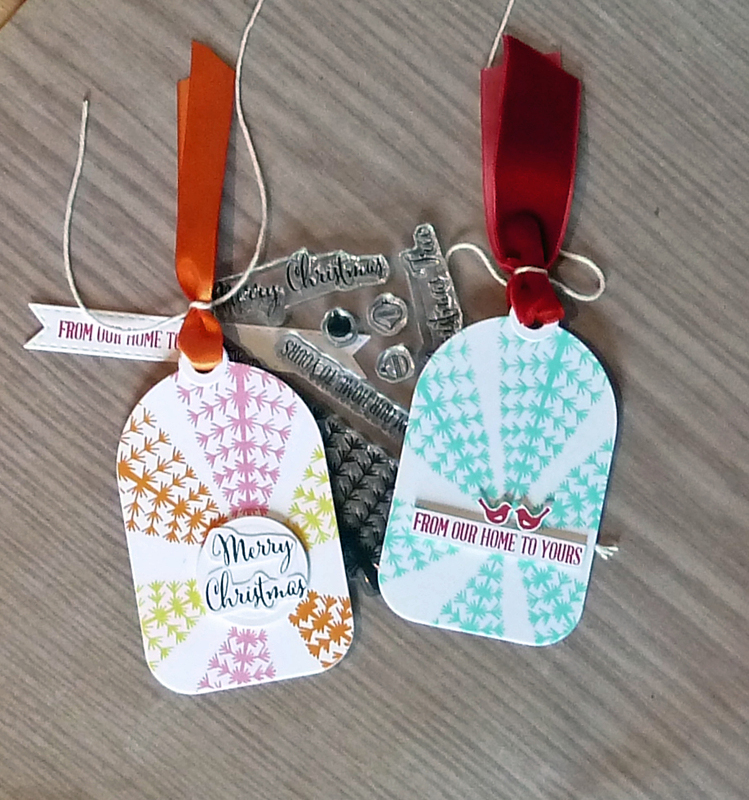 These are wonderful and what a fun and clever way to use that sweet tree stamp! 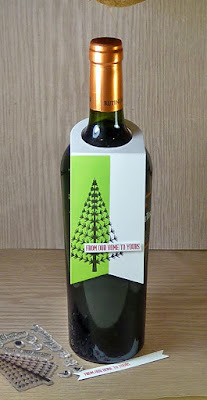 That is a cool pattern for a Christmas tree and I love the modern feel of it - it looks fantastic as part of that colour block wine bottle tag. I love the wine tag! Great colors! Traditional or modern and graphic, they all look amazing Joyce! I love your inspiring color choices, Joyce. 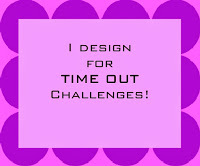 The patterns on your tags and color choices are also very inspiring. Joyce, these ARE beautiful! I would NEVER have guess they were from a tree stamp. As soon as I saw it I was thinking "WOW, how did she DO that?" Gorgeous! I love your modern and graphic wine tag design! And then even more to admire with your inspired use of the tree as an abstract design element. So well done! Oh Oh Oh, these are some cute projects! Love the modern wine tag & they're you go again being so creative with an image! Cool tags, Joyce! Oh what fun! Such striking tags and such a clever use for the tree. So creative on your pair of tags, but I also love the boldness of the first with the color only on half of the tag! Very creative! I love how you made the wine tag with the tree stamp - rather modern looking. 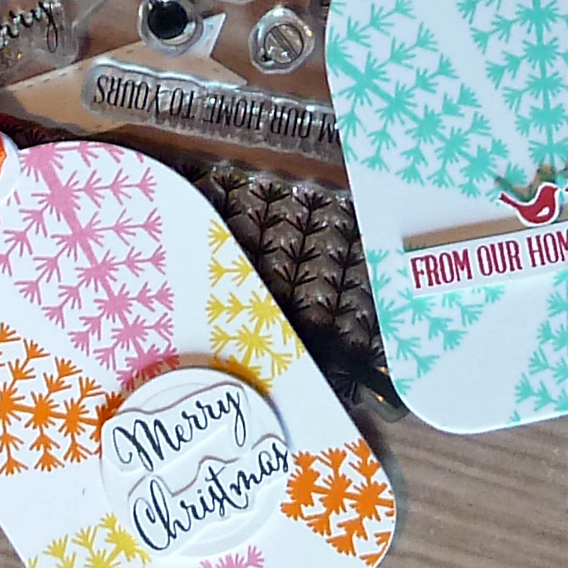 Even after seeing the wine tag, I thought the little tags were made from bird feet, lol! Now that you explained it, I can see it was the top of the tree. Thanks for sharing! 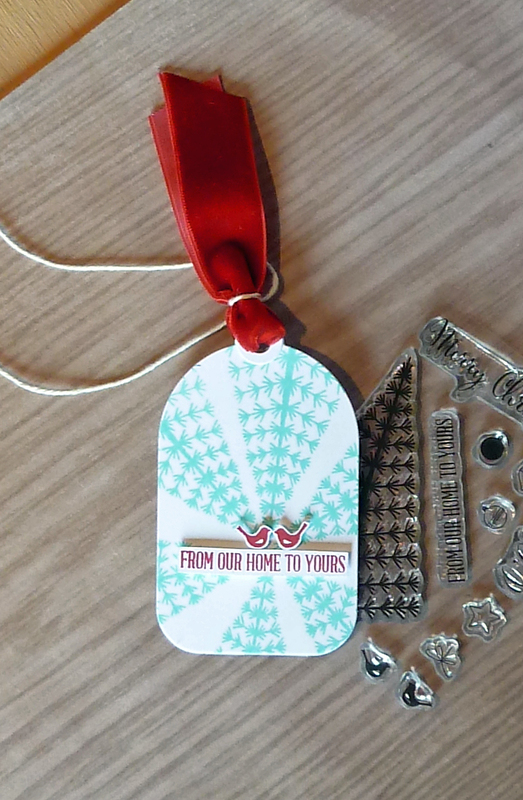 Loving your wine bottle tag, the tree looks fantastic the way you orientated it on the Tag. The other are so cute too!